WALTERS: The Obama administration does not want Israel to build any more settlements on what they consider Palestinian territory. What is your view on this? PALIN: I disagree with the Obama administration on that. I believe that the Jewish settlements should be allowed to be expanded upon, because that population of Israel is, is going to grow. More and more Jewish people will be flocking to Israel in the days and weeks and months ahead. And I don’t think that the Obama administration has any right to tell Israel that the Jewish settlements cannot expand. WALTERS: Even if it’s [in] Palestinian areas? PALIN: I believe that the Jewish settlements should be allowed to be expand. Article 49. The Occupying Power shall not deport or transfer parts of its own civilian population into the territory it occupies. In addition to violating Israel’s obligations under international law, the settlements are a major source of anger and frustration for Palestinians, and one of the main drivers of extremism and violence among both Palestinians and Israelis. By further entrenching Israel within the Palestinian territories, the settlements also make a two-state solution — which both Presidents Bush and Obama have recognized as a central U.S. national security interest — far more difficult to achieve. Palin’s wild views on Jewish settlements might help her steal some radical right-wing religious support from Mike Huckabee, but they have disastrous implications both for U.S. and Israeli security, as well as for Palestinian national and human rights. AlaskaReport has learned this morning that Todd Palin and former Alaska governor Sarah Palin are to divorce. Multiple sources in Wasilla and Anchorage have confirmed the news. A National Enquirer story exposing previous affairs on both sides led to a deterioration of their marriage and the stress from that led to Palin’s resignation as governor of Alaska. The Palins were noticeably not speaking to each other at last Sunday’s resignation speech in Fairbanks. Sarah ditched Todd (MSNBC) right after the speech and left without him. Sarah removed her wedding ring a couple of weeks ago. Sarah has recently purchased land in Montana and is considering moving the family there. Sarah Palin is originally from Idaho. Todd Palin told Fox News last week that he was heading back to his job in the oil fields of Alaska, yet Sarah recently signed a book deal reportedly worth $11 million. 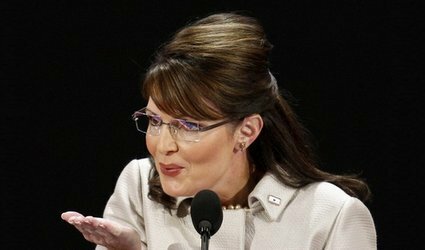 Editor’s note: AlaskaReport was the first website to report that Sarah Palin was running for governor of Alaska and the first website to report that Sarah was picked as John McCain’s VP candidate. Former Alaska governor Sarah Palin says politicians need to have thick skin “Just as I’ve got” Which of course is hilarious since she quit as Alaska’s governor complaining about her hurt feelings from Alaska’s bloggers reporting on her numerous ethics violations. (CNN) — Sen. John McCain said Sunday he would not necessarily support his former running mate if she chose to run for president. Speaking to ABC’s “This Week,” McCain was asked whether Alaska Gov. Sarah Palin could count on his support. “I can’t say something like that. We’ve got some great other young governors. I think you’re going to see the governors assume a greater leadership role in our Republican Party,” he said. He then mentioned governors Tim Pawlenty of Minnesota and Jon Huntsman of Utah. “She invigorated our campaign” against Barack Obama for the presidency, he said. McCain was pressed on why he can’t promise support for the woman who, just months ago, he named as the second best person to lead the nation. “Have no doubt of my admiration and respect for her and my view of her viability, but at this stage, again … my corpse is still warm, you know?” he replied. In his first Sunday political TV appearance since November 4, McCain also promised to work to build consensus in tackling America’s challenges, and criticized his own party for its latest attack on Obama. McCain rejected complaints from the Republican National Committee that Obama has not been transparent about his contacts with Illinois Gov. Rod Blagojevich. McCain‘s answer came in response to a question about comments from RNC Chairman Mike Duncan. The RNC also released an Internet ad last week, titled “Questions Remain,” suggesting Obama is failing to provide important information about potential links between his associates and Blagojevich. Blagojevich was arrested Tuesday and charged with trying to trade Obama’s Senate seat for campaign contributions and other favors. McCain said he, like Obama and many other lawmakers, believes Blagojevich should resign. Despite the heated nature of the race and attacks both former candidates lobbed at each other, McCain emphasized that he plans to focus on pushing lawmakers past partisan politics. “I think my job is, of course, to be a part of, and hopefully exert some leadership, in the loyal opposition. But I emphasize the word loyal,” McCain said. He pointed out that his poll numbers dropped along with the Dow. The key to moving past the stinging defeat, he said, is to, “Get busy and move on. That’s the best cure for it. I spent a period of time feeling sorry for myself. It’s wonderful. It’s one of the most enjoyable experiences that you can have.